In some ways, the nineteen eighties was a troubled decade for loudspeaker design. Although a number of ‘milestone’ products appeared – such as Celestion’s SL6 and Acoustic Energy’s AE-1 – it’s hard to argue these were completely successful designs in themselves. Rather, they proved more notable for what they subsequently made possible, rather than for what they actually did. The decade is best remembered as an important ‘rite of passage’ in speakers, sweeping a new broom through a sea of big, bloated multi-drive unit seventies speakers and installing the rigour of metal dome tweeters, minimalist crossovers and small, pert cabinets in their place. Intriguingly, this loudspeaker was the brainchild of Robin Marshall, more famous for the brilliant work he went on to do with Epos and the ES14. He had started his career at the BBC, entering directly from university as a mathematics and computer science graduate. There he’d got to work on a number of speakers, including the famous LS3/5A. Upon leaving, he hooked up with the retailer KJ Leisuresound, whose owner John Read gave him a job making loudspeakers, effectively starting the Audiomaster brand. His Beeb connections ensured that it won a license to manufacture the LS3/5A, causing it to grow at an alarming rate. By 1981 the business imploded and it was then that Monitor Audio’s Mo Iqbal offered him a job. The MA R352 and R252 were his first two designs, and the aluminium domed R852/MD, and R952/MD followed. After two years, Marshall finally left to set up Epos Acoustics and launch the famed ES14. He has described the MA R352 as a “mould-breaker”, saying that when he looked around at what other people were doing, he though it seemed pointless to “just make another clone”. Indeed it is not – at 640x250x318mm it’s a pretty big box and taller still on the custom MA stands, which are angled slightly up to improve dispersion. The cabinet is beautifully veneered – MA produced some spectacularly finished boxes through the eighties – and thick, strong and solid at 13kg apiece. Inside sit a 200mm plastiflex mid/bass unit and a 25mm soft dome tweeter, with a large bass port completing the front baffle layout. Its driver complement is remarkable for being entirely ‘old school’, albeit done to very high standards. The combination of relatively unsophisticated drive units and a large, bass reflex cabinet made for an excellent 91dB sensitivity and a very benign nominal 8 ohm load. Compare that to the 85dB sensitivity of the then ‘flavour of the month’ Linn Kan (sealed box mini monitor) which retailed at a similar price to the R352’s £350 and you can see how different it must have seemed! One obvious result of all this sensitivity is brilliant transient performance, and this is where the Monitor Audio shines. Don’t expect it to have the neutrality of a classic BBC design, or the clarity of an electrostatic – this is to miss the point. The R352 is all above about giving a fast, involving and tuneful sound, and this is what it does – in spades. Moreover, whereas price rivals like the Kan were also very musically engaging but had precious little bass, the MA has loads of it. Interestingly though, it’s not a seventies style fat, bloated low frequency performance. Rather, it’s decently tight, taut, grippy and tuneful. However, you still get the distinct impression that this is a big, barrel-chested loudspeaker that’s at home in something bigger than a box room. This is the beauty of the R352 – it has that largish, quite warm seventies sound that so many of us living with nineties speakers yearn for, yet it has a good deal of eighties-style speed and rhythm – the best of all worlds, in other worlds. They were a popular product in the mid-eighties, but these days you see precious few around (either their owners are holding on to them, or their downright ashamed of them)! Prices range from around £10 for a tatty pair up to £300 for a mint set complete with the very desirable factory spiked stands. Either way, you’re getting a lot of loudspeaker for you money – precisely why people bought them all those years ago. Halo,i have been looking this monitor audio r352 to purchase them. Any advise where can get them today ? They’re quite old now, so eBay is your best bet. Either that or the classified sections of hi-fi magazines. Make sure you hear before you buy, if you possibly can. I have a pair of them right here. I went to the underground parking lot to take out the garbage one day and there was a set sitting next to the dumpster. I looked them over and could tell right away that they were quality by the weight and the fact they were made in England. I brought them upstairs hooked them up to my Onkyo amp and in no time I was looking for a new apt building to live in. Yes they sound awesome. My previous speakers were Wharfdales and Bose 901s and these sound good compared to them. I guess it was a pretty good find. I bought a pair of the metal dome version for £40 (& still have them) in 2008 in very good condition with just a few scratches here & there. They’re fabulous in my opinion. Very natural sounding with a big wide open sound stage & plenty of depth to them too. The bass though on occasions can be a little poorly controlled in my modest room, this can be solved by bunging the ports up with socks or whatever. I wouldn’t totally block the ports with solid objects as the bass/mid units are not designed to withstand the forces that would be inflicted upon them by the extra air resistance of an infinite baffle. BTW, the bass/mid unit cones are made of good old fashioned undoped paper not “plastiflex” & better for it no doubt. I wouldn’t change them for anything else – I’m totally satisfied with these. I just bought a pair of R352’s. I am going to buy an old amplifier as well. My options are AR60, musical fidelity b1, etc..
Hi Babis – A&R A60 is a nice safe bet, especially the later ones with RCA phono inputs. The Audiolab 8000a is another strong candidate, again you want a newer post-1993 model with better circuitry and more power if possible. It’s not so musical as the A&R, but is cleaner and punchier. Other options are the Inca Tech Claymore, which has much of the power of the Audiolab with more bounce than the Arcam, or even an Exposure X, which is tighter than everything here – but rarer and harder to find. I would avoid the Musical Fidelity B1; it looks nice but it was the poor relation to the A1, and also wasn’t terribly sophisticated sounding; the R352s would be too good for it, I think. Hi Babis, I want to buy the same model R352 Monitor Audio like your, but I am from Vietnam. Do you have any ideas to help me ? Looking for your reply 🙂 Thanks. I get great results with my R352MD’s connected to my HK 980 amp & Philips TDA1541/CDM4/19 based cd players – there’s a synergy. Realspin, have you ever heard the less common MD version? The treble is more open, extended & refined compared to the standard plastic dome in my opinion. Hi Andrew – thanks for that. Yes, I have heard the MD version of the 352. Actually I think it’s nicer now that CD has calmed down and we are getting better hi-res digital. In the eighties it seemed a bit too steely and zingy for my tastes, with many pretty crude sounding CD players around. I should think the standard 352 on the end of a TDA1541-based Compact Disc spinner is a lot of fun! I found that the MD’s performance is greatly improved by very very carefully removing it’s metal mesh protector. You’ll always find poor recordings that over step the mark whatever system one has, because THAT is/was the main problem ie the huge variation in recording standards, not so much poor replay equipment at that time. I find many contemporary cd players (including my recently sold Audiolab 8200CD) lacking in tonal colour & dynamics compared to the TDA1541 based players of old, what about you? I could never describe any implementation of the TDA1541 that I’ve heard as “crude”, though many of the 80’s cd recordings were very poor. Some people who’ve never heard a live orchestra before complain about the raw rasp of a trombone on a cd recording – it IS meant to sound like that & not be rounded off to sound pleasant. I Love my R352s, bought them brand new in UK in the mid 80s, paid GBP 150 if my memory is correcy. Mine are beautiful in teak, and blend in beautifully in my lounge in Auckland, New Zealand, which is finished in Rimu, a NZ native timber. They were delivered to the shop in Boston, Lincs, by the company man, direct from Cambridge a few days after I ordered them. That was great service. I am very happy with my purchase. I don’t think there can be too many here in New Zealand. Listening to our wonderful Auckland Town Hall organ on the radio as I write this. Don’t miss it if you are ver down this way! They became unfashionable due to their shear bulk & the false hyping of new products by the less than honest hifi press, but those that sold them on, I’m sure regretted that decision later. From what I’ve seen on ebay, when they do become available, they now tend to attract higher prices due no doubt to blogs like this extolling their virtues, lol. I know what you mean about organ music on these. My CD recordings of Bach’s organ works sound absolutely fantastic & correct, as they produce a natural but large sound stage & deep bass. That MD on mine though provides an extra crispness & bite, though not excessive, which allows the reediness to shine through. Bought my R352’s 2 years ago; good old Ebay! £35, in black with original stands and packaging. But, at the moment I am finding them just missing a little something at the top end. Put new capacitors in the cross-overs which made a big difference, but have been dithering over fitting MD tweeters. Possibly the problem is the Cambridge Audio Minx Xi, which is probably a bit under-powered. Building up to restoring and improving my old Quad 405 which used to drive MA3’s to my huge satisfaction, but then I have to buy a better….etc etc. I have found one pair of these marvelous speakers and I am in negotiation with the salesman.I wonder if these R352’s is going to fit well with my stereo receiver Yamaha RX 397 which is 2 x 50 W at 8 ohm impedance. 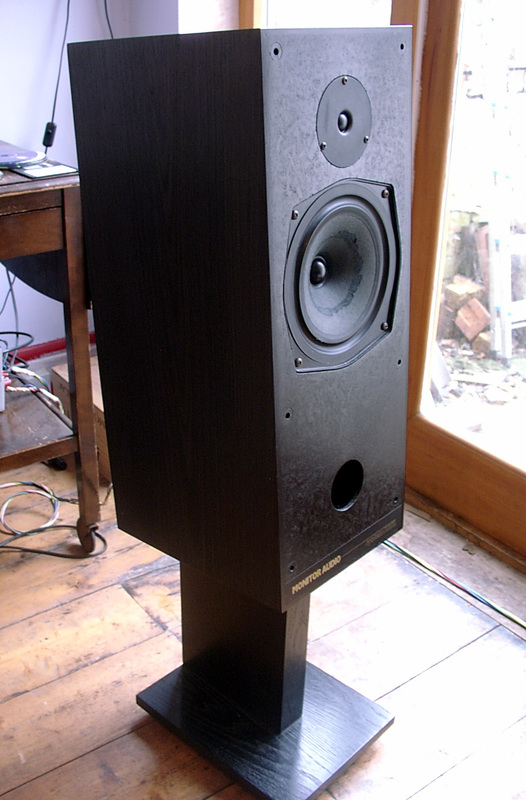 I think these 352’s are the great vintage example of excellent speakers. The owner doesn’t have the stands, so I assume I should get ones or find some nice alternative. I have NAD 514 CD player which should be a nice source for music. What is your opinion about this? Any advice? I should expect the R352s will fit in just dandy! Well worth seeking out the original stands for aesthetic reasons, otherwise go for a pair of 16″ column stands from Atacama or similar.